First of all, I must thank many people who helped us in this memorable process. 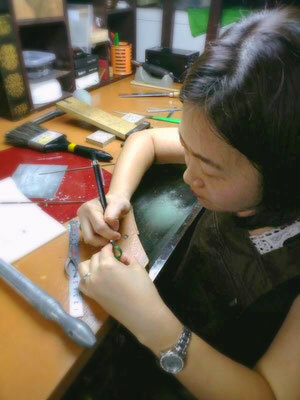 Firstly, thank you to Iida-san, a professional master in handmade ring, for his patience in guiding us through the difficulty in design concept to engraving our design onto the wax mould. Then, I must thank my dear friend Tomo for connecting us with Iida-san and helping me with my queries. 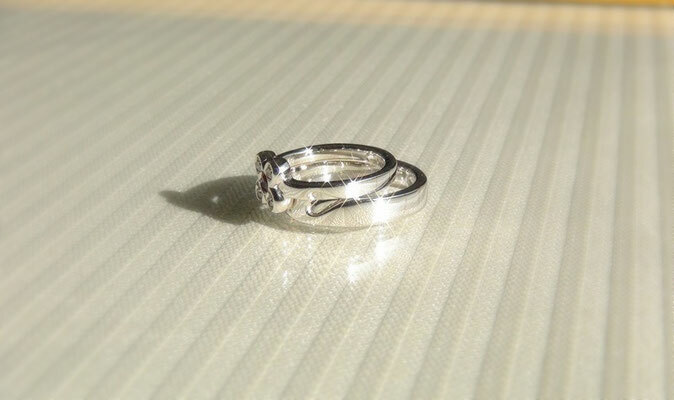 Next, I must thank Miki-san for her heavy responsibility in safekeeping and deliver our rings from Tokyo to Singapore. 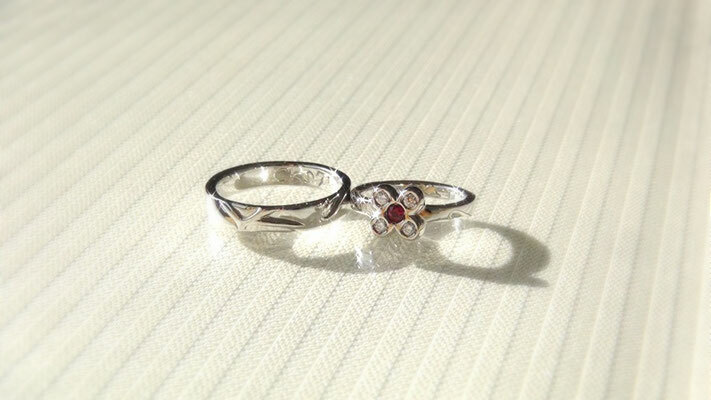 Last but not least, my dear husband, despite his busy work schedule, he was willing to make the rings together with me. I have always know that I am an impulsive person. My friends and family could not understand why we are spending unnecessarily again to get another pair of rings when we already have our wedding bands. Some may think that we are rich or I am a spendthrift. Even Iida-san was also asking whether this is for our anniversary. We got married in January 2012 and it was August 2017 when we were at Rinpla. We knew each other since 2008 but it was not 10 years yet. Should I call them anniversary rings? It is not quite true either. From the above reasoning, I believe we do not have the “valid” reason to make our rings. The idea of making my own ring started way before I got to know about Rinpla. Honestly, if you ask me, I feel that the wedding bands sold commercially are lacking “soul” of the love between couples. Of course, before we knew there is an option of handmade rings, we did what all couples did. We shopped our wedding bands and the most we could customize was only to engrave our initials and wedding date on our rings. It was a day husband discovered he lost his wedding band. We went furious and searched everywhere with no results. Sad and disappointed, we went to buy the replacement ring. Though the new one looks exactly the same but I only feel the emptiness in it. Maybe it is just me, I am an emotional person. I have lots of weird things running in my mind. I care of something maybe minute to others. Then, It was a day I passed by Lee Hwa Jewellery, the place where we got our wedding bands. The Queen Elizabeth ring was shown on the advertisement board. It was so elegantly beautiful, of course, with so many diamonds. I was bold enough to ask the price and as expected it was very expensive. I was not a fan of diamond anyway. I am in love with the colour and design of the ring. So it remained my dream ring for years. I told husband to look for alternative, to make a copycat version with other stones. I tried searching even on Taobao but could not find this kind of service. Until one day I saw Tomo making an anniversary ring for Miki. I was surprise that service that I have been looking for years it actually existed! It is even more interesting to me that we can make the ring ourselves. Knowing that Rinpla is located in Tokyo, I did not pursue further after checking with Tomo and I slowly forgot about this. This year, it was a last minute decision to tag along husband when he was posted to Tokyo the second time of the year. It was my first visit to Tokyo. Just a few days before departure, I bumped into Tomo at the MRT station and I brought up the discussion on Rinpla. 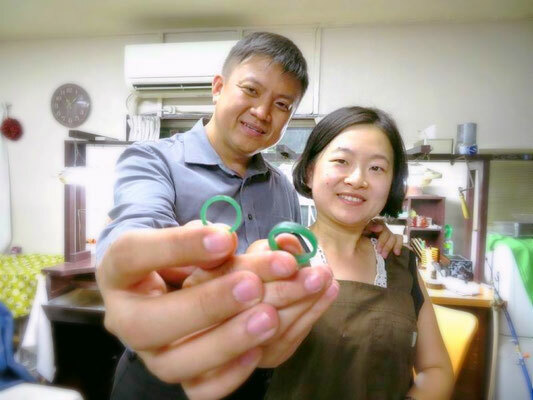 I was hesitate to meet Iida-san at first, due to husband’s busy schedule and many logistic issues that I could foresee if we decided to make our own rings. We had very little time at Tokyo and could not bring them back ourselves. 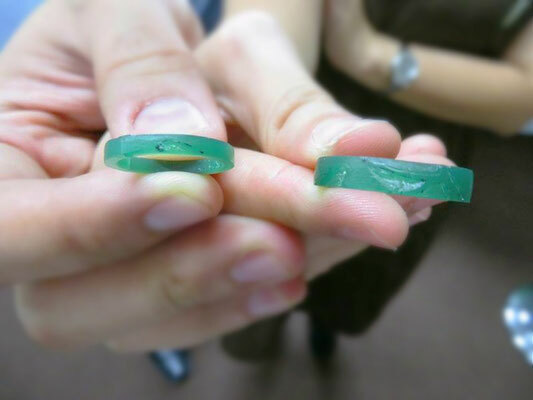 The process takes about a month at least to cast the ring from wax mould to the real rings. The first day of meeting, we walked on a rainy night to Rinpla and greeted by Iida-san with towels for us to warm our body. I am not sure if the thoughtful gesture is typical to Japanese but I am touched. Knowing we may not able to make our rings but Iida-san was still patient and answer all our queries. In fact, we communicated via Google Translate and overcame the language barrier. On the second day, I went to Rinpla alone first and husband joined later after his work. As usual, I have no sense of direction and I got lost even with Google map. Iida-san came to my rescue in the end. We had a lot of debate before deciding to make a pair of our rings. And, whether to make one ring or a pair? If we did not had a pair of wedding band before, we would not hesitate. To be honest, the price quoted was not cheap to us but it is reasonable considered with its material and the meaning behind the rings. You learned a new knowledge in handmade rings and most importantly you get a chance to make the rings with your loved one. Every time looking at the rings, you remember the time when you make the rings together. I also changed my ambitious design from a Queen Elizabeth ring to a simple, doable, cute flower design, with my beloved ruby. 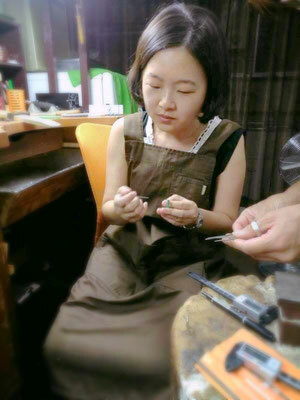 Iida-san helped me to screen many ruby stones under microscope to find the best ruby for my ring. I drew my design on a plain paper, Iida-san helped me to convert it to measurable dimension on graph paper. Husband had no idea how to design his ring. In the end, he was able to come out a ring which can represent his name. During the handmade process, I was making the ring for husband and he did mine. My finger is small, the ring size is tiny, to his horror husband broke the wax ring half way but managed to be saved by Iida-san. Do you need a reason to make a pair of rings yourself? In the end, we decided to follow our heart. You do not need a reason to do something. Just do it! Before it is too late, before you started to regret. Opportunities come by and go. If we did not spend for this, we can use the money for our next travel fund. Saving the travel fund for a pair of rings that we can treasure for the rest of our marriage, I think it worth the effort and price. The finished piece of rings look so beautiful and now I started to worry that I may damage the ring during wear and we even fear to lose them. I must recommend the service from Rinpla. Even when it comes to little details like the box for keeping the ring was so beautiful, even more superior to the paper ring box we had seen before. 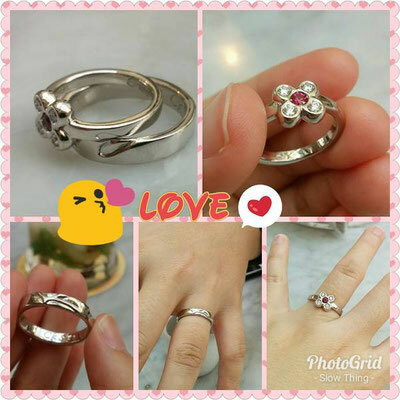 If the logistic part could be solved, I strongly recommend couples who are getting married or anyone who would like to design a unique ring for yourself, to look for Rinpla.